Overall weekend totals are likely to stay in the range of 6-10 inches for most of the D.C. metro area. Areas to the south could get 8-12 inches of snow. Expect difficult road conditions and snowfall continuing all day Sunday. 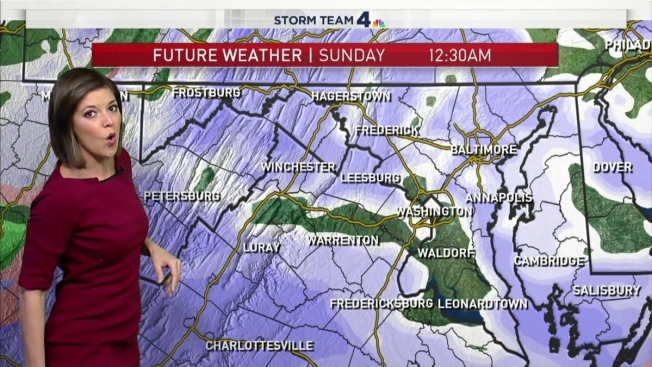 Local authorities are urging D.C. area residents to stay off the roads as a massive winter storm dumps several inches of snow over the whole region. Storm Team4 expects the D.C. metro region to see 6-10 inches of snow. Areas to the south could see 8-12 inches, Storm Team4 Meteorologist Amelia Draper said. Saturday night, 2-5 inches are forecast to fall near the District. Continuing heavy snow will dump another 4-8 inches during the day Sunday, Draper says. Many activities at schools, churches and community centers are canceled Sunday. You can find a full list of closures here. There were a number of road crashes in the D.C. area as the first night of heavy snowfall began Saturday. News4's Darcy Spencer reports on how Northern Virginia is dealing with the year's first major storm. 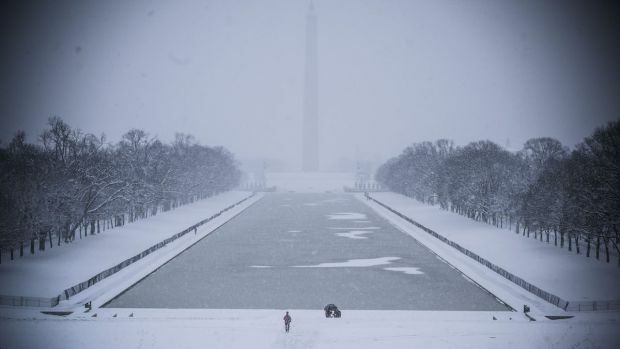 A winter storm warning is in effect for the D.C. area until 6 p.m. Sunday. The big question is whether the storm will taper off Sunday night. At this point, Draper says another major wave of snow is unlikely overnight Sunday. The snow is forecast to be finished by 5 a.m. Monday. The area will likely see some schools close or open on a delayed schedule on Monday. Local governments pretreated roads and deployed plows, but you should still exercise caution when driving as the snow begins to accumulate. 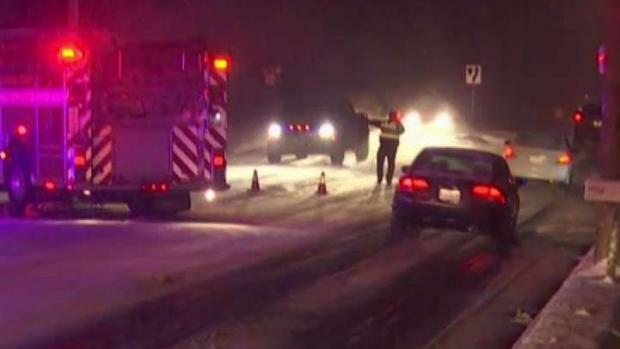 Montgomery County police responded Saturday night to more than a dozen car crashes. Many areas, including Leesburg, Frederick and St. Mary's county, declared snow emergencies that affect where you can park your vehicle. Check for signs and with your local authorities. Gov. Ralph Northam declared a state of emergency in Virginia, allowing the state to mobilize more people and resources to clean up the snow. Snow started falling after noon Saturday. Some areas began to see accumulation after sunset, especially on grassy areas. Snow will continue through the day Sunday and could be heavy Sunday night. This likely will be the longest stretch of winter-like weather we've seen so far this season as the cold stretches all the way through next week. D.C. Fire and EMS released a list of resources for anyone who needs shelter. The News4 Telemundo 44 Health & Fitness Expo is this Sunday. We recommend taking public transportation to the free, family-friendly event.